I am sure if you have a free spirit residing somewhere deep inside, you must be carrying with you a list of to-do adventures. For me, the list only came into being over the last few years after I relocated to Canada, where I discovered my love for camera and the heavenly scenery around me. The quest to find that next best shot or the view from the top led to hiking. The feeling that you get when you go around an outcropping rock and the lookout opens to a vast valley leading to snow-capped mountains or clouds swirling below, or that first look at the sun as you sit at the top of your trail Ã¢â‚¬â€œ that rush cannot be described, only felt. After a while, I grew more adventurous. Denali, Machu Picchu, K2 Base Camp, Gondogoro La, and Kilimanjaro were my next targets. Having done the K2 trail last year, the coin was flipped and the call for 2017 came from Kilimanjaro, the tallest free-standing mountain in the world and AfricaÃ¢â‚¬â„¢s highest point, standing at 5,895m above sea level. Kilimanjaro is also the highest dormant volcano in Africa, consisting of three volcanic cones: Kibo, at the highest altitude, then Mawenzi at a lower altitude and Shira, the lowest cone. 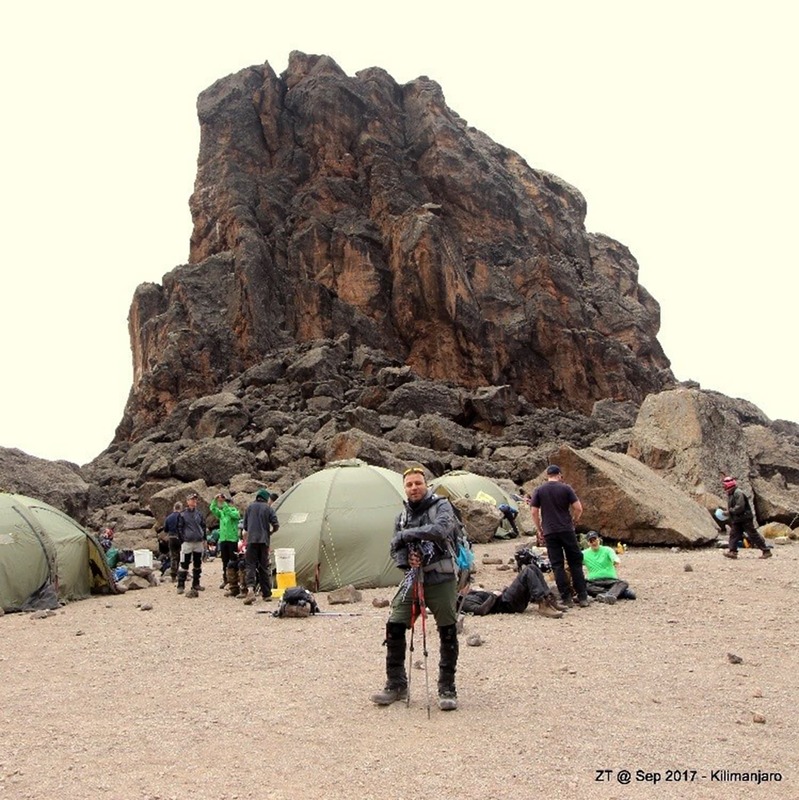 In September this year, I booked myself in for the six-day Machame route to the top of Kilimanjaro. The customary reminder for such adventures is a must here as well: Know your group, guide, route, climate, your limit and, above all, plan for the trip. Even more importantly, you will hear the wisest chant time and again during the trek: do itÃ‚Â “pole, pole”Ã‚Â (slowly, slowly in Swahili). I met my group on a Saturday morning Ã¢â‚¬â€œ Scott, Mike, Will and Colin. Two brothers, a brother-in-law, and a high school friend. Our guides and porters welcomed us with the Swahili greeting,Ã‚Â “Jambo”. And it immediately hit the right spot. We compared our notes, who has done what before, who has what kind of medicines, who has Diamox the altitude sickness medicine, who has the painkillers, who hikes fast, who hikes slow, and above all, who loves to play which card game. Our guide Minja preferred to be called Mr Goodluck or Mr 100%, while our assistant guide wished to be called God bless. We needed all three, so we were just fine with the names! The first day of the hike was an easy-paced one. We spent almost the same time travelling from Arusha, the city where we were staying, to the starting point of our trek, Machame Gate, and registering ourselves, as we spent on the trail that day. 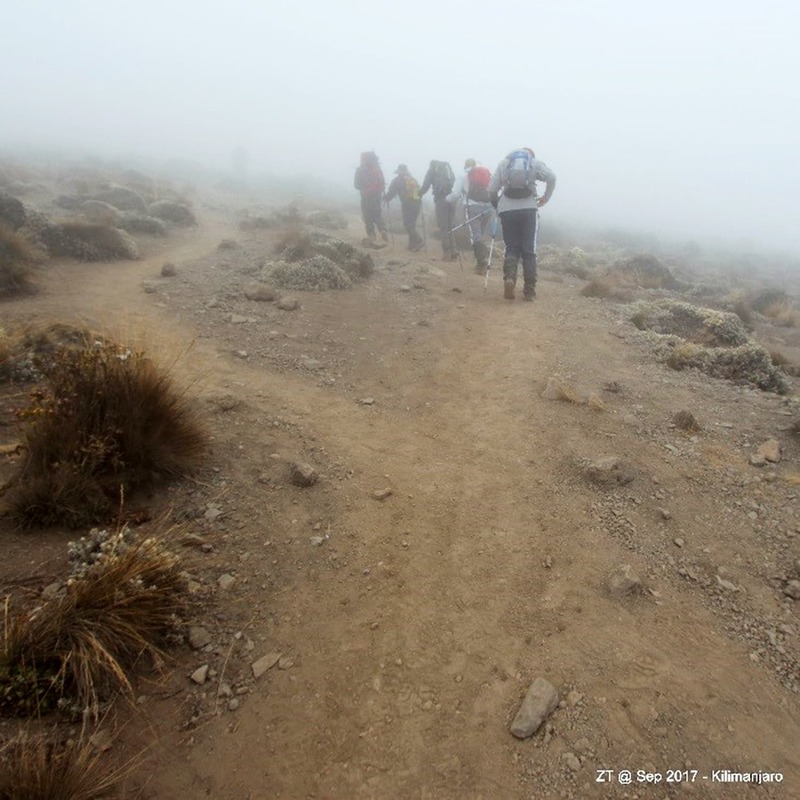 There are many routes you can take to reach the peak; Machame is the most popular. This is primarily because of the impressive views, varied habitats, and shorter duration. The starry night at the Shira plateau. At the same time, it is also known as the whisky route, given its reputation for the tough climb. 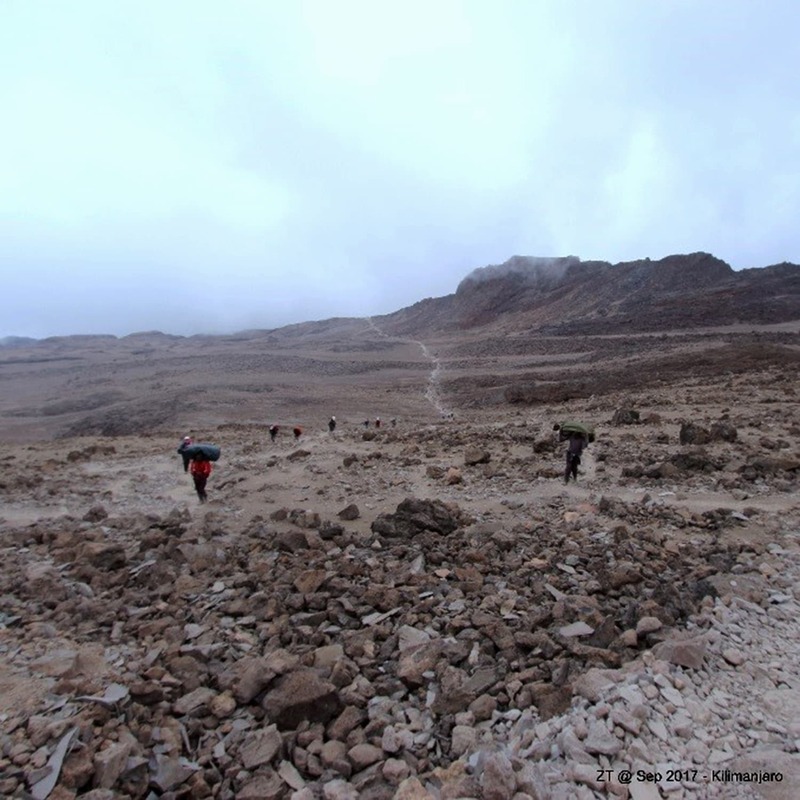 This lies in contrast to the Marangu route, which is nicknamed Coca Cola for its ease and the provisions of huts to sleep in rather than tents. Machame Gate is at an elevation of 1,640m. After registration, we started a gentle climb through the lush and fertile rainforest canopy. In about four hours, including a stop for a quick snack or two, we reached Machame Camp which is located at a height of around 2,850m. It is a 11km hike, and a good appetiser for the days to come. 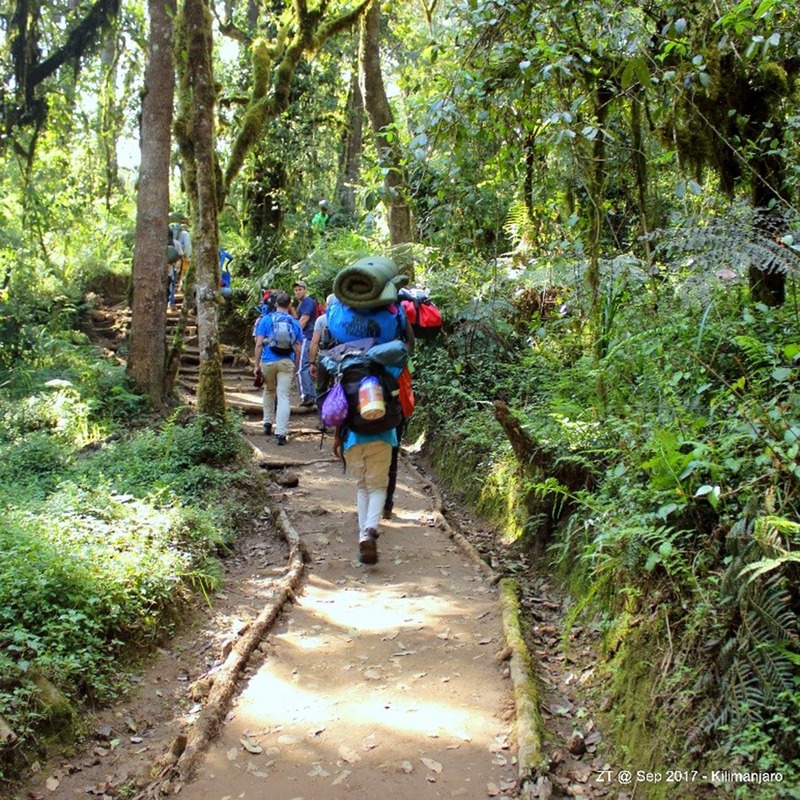 On the second day we hiked to Shira Camp, the second camp on the Machame route. 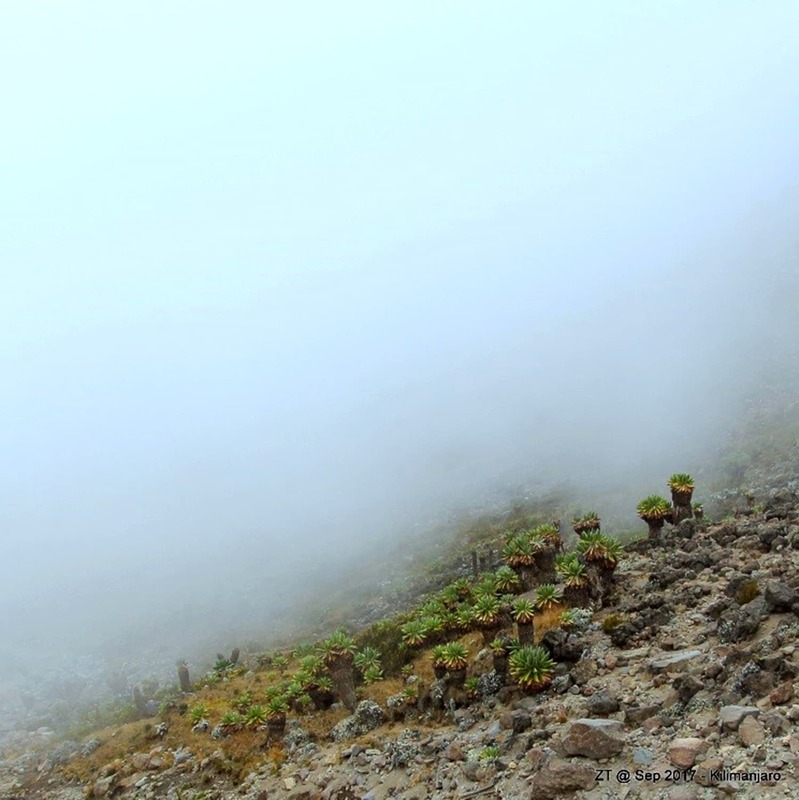 Shira is a plateau around 3800m high, home to the shortest volcano on Kilimanjaro. It is a short hike, around 5km long, with a 1000m elevation gain. The terrain changes from rainforest to moorland. If you are lucky, as we were, you may be walking in clouds for some part of the hike, giving the moorlands a magical exposure. The habitat gives rise to some peculiar plant species that are only found here. These plants seep the moisture from the atmosphere, creating an oasis in an otherwise barren landscape. 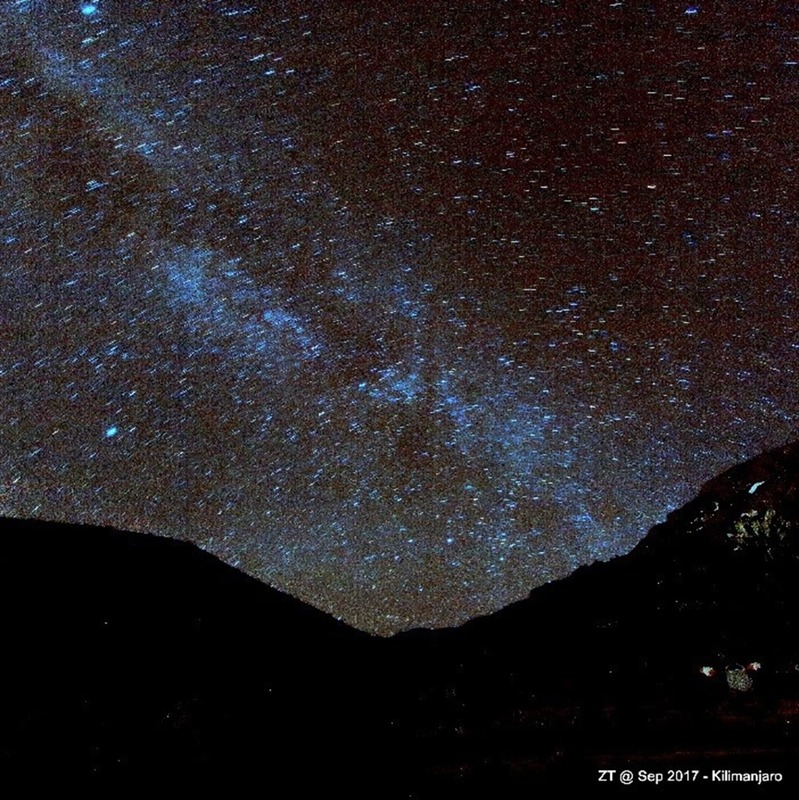 Shira Camp is also a great location for stargazing as the sky is completely dark and clear. On this day, we got our first exposure to an altitude of more than 4000m. We started at the Shira plateau and then kept climbing gradually through a gentle slope to a maximum elevation of 4800m at the Lava Tower. From this point on, the Kibo peak was always in our sight, the highest volcanic cone on Kilimanjaro. The Lava Tower is a single piece of rock jutting out at the top of the climb. It is also called The SharkÃ¢â‚¬â„¢s Tooth. We only stayed there for a quick lunch. Our group en route to Shira plateau. We continued to climb down to the Barranco campsite. You end the day almost at the same elevation as where you started, but the climb to the tower is an important step to acclimatise yourself and prepare for the summit night. Given my prior experience, I marked this to be the end of non-technical hiking. The next day onwards we would finally begin the 36-hour journey which will take us to the top of Africa and back. The Barranco campsite is right in the shadow of the mountain. The morning started with a beautiful sunrise over the peak. The porters celebrated the start of the day withÃ‚Â Jambo BwanaÃ‚Â Ã¢â‚¬â€œ a nice combination of lyrics with its origins in Kenya. Anyone who has watchedÃ‚Â The Lion KingÃ‚Â will be able to recognise, among the lyrics,Ã‚Â Hakuna MatataÃ‚Â which means Ã¢â‚¬Ëœno worriesÃ¢â‚¬â„¢ in Swahili. 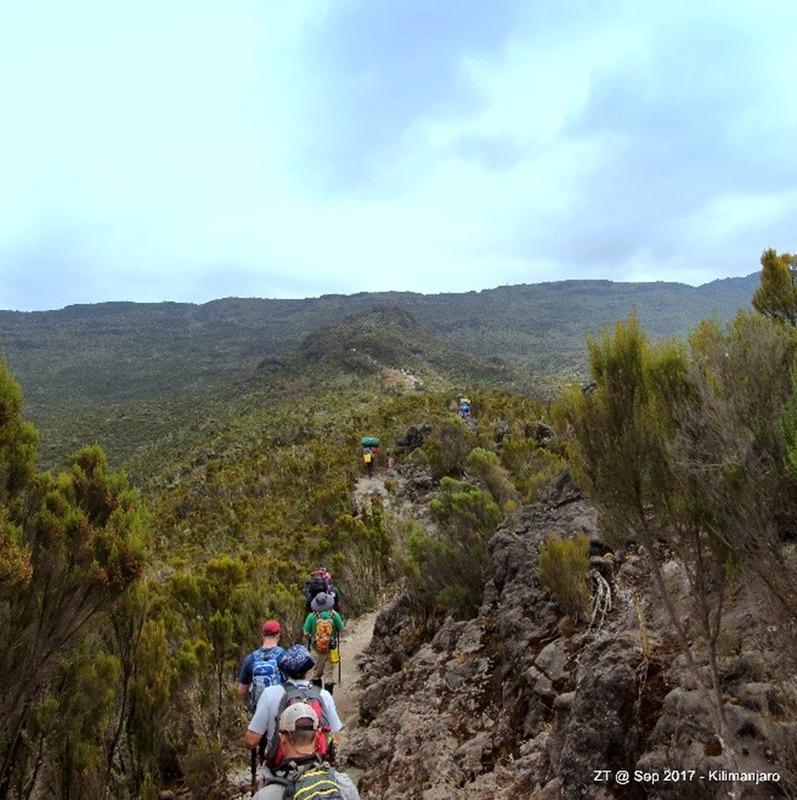 After breakfast, we left the camp and headed towards the steep ridge of the Barranco Wall. It was astonishing to see the porters carrying up to 15kg on their shoulders and heads, passing by at running pace while we scrambled on our hands and knees to climb up a few narrow ledges. In front of Lava Tower. Soon we were on top of the wall and the scenery opened. At this elevation, the environment is reduced to a desert and there is no vegetation in sight. We walked towards the Karanga Camp, which we saw from the top of the ridge, and it looked like it was just a few hundred yards away. That is until we realised that there was a steep valley between us and the camp. We ran into a hail storm on the way to Karanga but it was short-lived. Finally, we reached the Barafu Hut, 4km from Karanga, our destination for the evening before we started our bid for the summit. The camp is at 4600m and here we got into our tents and lay down for a few hours of rest while admiring the Mawenzi and Kibo volcanic peaks in the distance. The next 24 hours were my toughest experience to date. The bid to climb to a final elevation of 5895m really tested our will. Our target was to reach Stella Point, the rim of the crater of Kilimanjaro, in time for the sunrise. We woke up at midnight and started our hike at one in the morning. The freezing temperature, the dark night, the vision limited to only the circular light of our head lamps, and the sharp gain of elevation Ã¢â‚¬â€œ 1300m over 5kms and 5hrs Ã¢â‚¬â€œ all played tricks. This was a game of mind over body. Within the first hour the trail started taking its toll. The lightheadedness is known to cause blackouts and headaches. The key is to stay focused, to take one step at a time. Your pace must be slow, but consistent so you can keep your body warm. The more you stop, the more difficult it will become to get yourself back into rhythm. Our guide only allowed us to stop after 70-90 minutes and that too for a maximum of five minutes. One of our team members drifted in a mindless walk twice. Slowly but surely, we kept climbing. The giant plants of the moorlands. Hiking through the foggy moorlands. Along the way, we saw seven or eight other groups. Almost every one of them had a climber or two who had their heads in their hands, or were feeling highly nauseated. 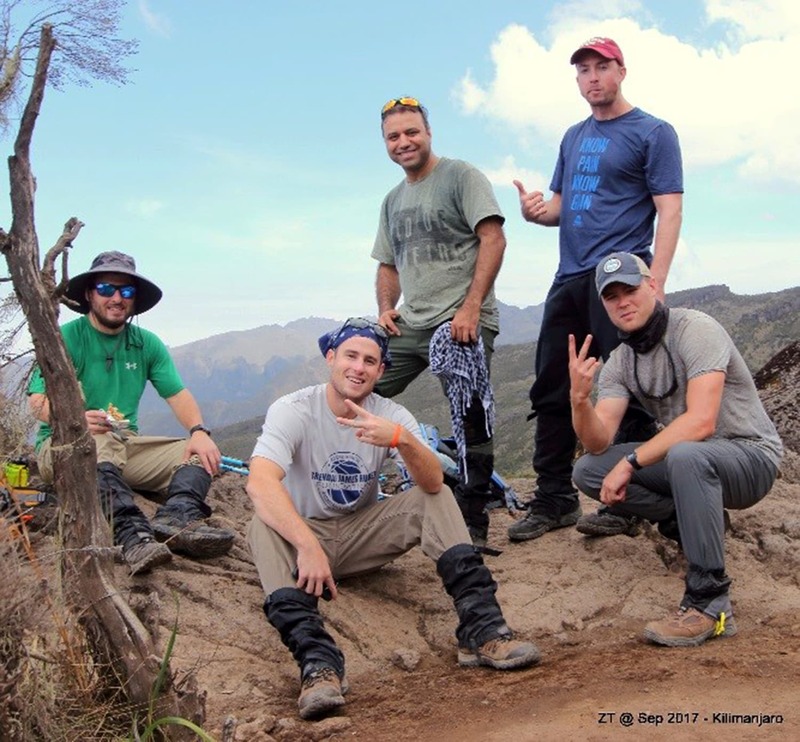 Altitude sickness is a real concern on the summit, and this is where we appreciated the importance of taking Diamox. We reached Stella Point just before sunrise. We stopped for 15 minutes to take it all in. We were completely exhausted and utterly drained. This is where it dawned on us that we were the first in Africa to feel the sunÃ¢â‚¬â„¢s rays on our faces today. The struggle to reach the top to witness the surrounding beauty had all been worth it.